Home Ecommerce Platform Could Amazon’s Latest Patent Destroy The Media Industry? A patent Amazon filed nearly 4 years ago has been awarded to the online retail behemoth which will no doubt have a major impact on consumers and publishers of digital content like ebooks, music, video, software and mobile apps. The broad patent applies to an electronic marketplace for the peer-to-peer resale of digital content. 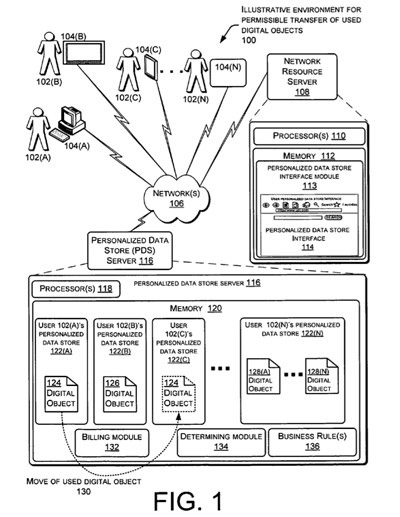 Here’s the abstract of US Patent 8,364,595. An electronic marketplace for used digital objects is disclosed. Digital objects including e-books, audio, video, computer applications, etc., purchased from an original vendor by a user are stored in a user’s personalized data store. Content in a personalized data store may be accessible to the user via transfer such as moving, streaming, or download. When the user no longer desires to retain the right to access the now-used digital content, the user may move the used digital content to another user’s personalized data store when permissible and the used digital content is deleted from the originating user’s personalized data store. When a digital object exceeds a threshold number of moves or downloads, the ability to move may be deemed impermissible and suspended or terminated. Additionally or alternatively, a collection of objects may be assembled from individual digital objects stored in the personalized data stores of different users, and moved to a user’s personalized data store. So what are the big implications? A monopoly on digital content marketplaces — a disruptive market that hasn’t even developed yet — is undoubtably gonna make Amazon a boatload of money at the expense of content producers and their channel partners. For content Amazon sells, it’ll cash in doubly, taking a cut from any resale. Already sitting on years of rich customer data, Amazon could really move used content, leveraging existing recommendation technology and communication programs like email and site personalization. Upcoming and existing marketplaces like ReDigi simply don’t have the brand, data or customer relationships to compete. If the patent is broad enough to block new entrants, Amazon could throw a bone and license rights to other players like eBay, Best Buy and Borders, taking a royalty on sales. There’s no difference in appearance, function or condition of a transferred digital file – it’s as new as the day of download (with the exception of old software and app versions). There’s no doubt an aftermarket option for finding digital goods at a lower cost is gonna make misery for content producers, app developers, artists, publishers and all channel partners that offer digital downloads. Sure, Amazon will cannibalize its own “new” download sales — but not necessarily at the expense of margins if Amazon’s not required to kickback content producers a second time. Though the lack of platform choice is meh for consumers, the arrival of the ability to cash in on used digital goods should get folks excited. But eroding profits for content producers means less good content will be produced in the long run. Amazon’s greed could ultimately hurt everyone, leaving its own self-publishing platforms the only option for creators. (Amazon Studios may not be far off). The legal aspects of how copyright law applies to digital content have yet to be settled upon. You don’t actually buy digital content – you license it, and your rights are subject to the license agreement of the content producer rather than by copyright law. “First sale” rights to resell physical copies of digital content don’t apply. The big concern with digital transfer is, without proof that all stored copies have been wiped from the original owner licensee’s device, a file could be retained and resold. The options are honor system or a technology that ensures devices are wiped. We do not know if Amazon has developed this technology, or how it plans to address this issue. The ReDigi marketplace already uses a forward-and-delete system that works with content purchased through iTunes and Amazon, but is currently facing a lawsuit from a major record company. Will Amazon launch a platform without working out the legal first? Another question is whether the Zon will wrap its own DRM around resellable content, perhaps even if content originally licensed without DRM (and if Amazon’s the only game in town, it can do whatever the heck it wants). Any standardization of how DRM and forward-and-delete technology operates would require co-operation from many stakeholders, and likely involve some royalties paid back to content producers. This could take years. Amazon’s unlikely to wait for all the ducks to line up. It’ll be interesting to see how this unfolds, and how it impacts the entire digital content space.